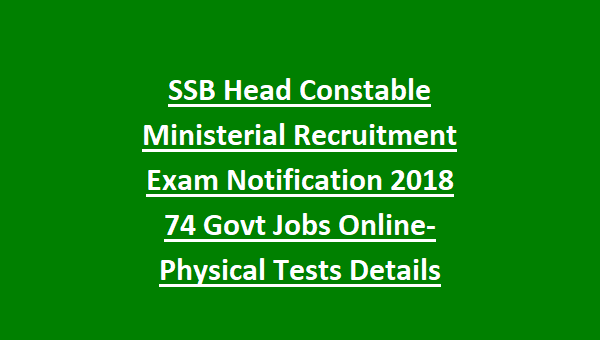 SSB Head Constable Ministerial Exam Syllabus 2018: Sashastra Seema Bal seeking online applications for the available vacancies of Head Constable Ministerial posts in SSB through direct recruitment 2018. There are total 74 Head Constable Ministerial jobs in this SSB Recruitment 2018. Closing date for online form submission of SSB Head Constable Ministerial Examination is 30 days from the date of notification given in employment news. The selection for SSB Head Constable Ministerial Recruitment 2018 is will be comprises of two stage written exam and physical tests, skill tests. Intermediate or 10+2 qualification having candidates can apply online for this Head Constable Ministerial jobs through SSB official web site only at http://www.SSBrectt.gov.in. Candidates should have typing knowledge also. 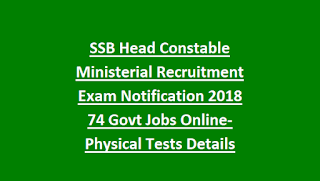 For more details regarding this SSB Head Constable Ministerial Jobs recruitment 2018 Exam pattern and syllabus, Physical test (Physical Standards tests, Physical efficiency tests)details, how to apply online, skill test details and for other information see the below given details. Last date to apply online is 30 days before the notification issued in employment news. There are total 74 HC Ministerial vacancies available in SSB current recruitment. Category wise details are given below. The candidates must have qualified Intermediate or 10+2 from a recognized board or institute. Must have the typing skills on computer in Hindi or English. Hindi typing (MANGAL FONT) with 30 wpm speed on computer. For General age limits are 18-25 years. For OBC age limit is 18-28 years. Selection for this SSB recruitment will held in various stages. For Male - 3.2 kms running race to be completed in 14 minutes. For Female - 1.6 kms running race to be completed in 08.30 minutes. No PET test for Ex serviceman. PET test qualified candidates only eligible for SSB PST tests. For all candidates except ST-Height for Male 165 cms, Chest 77+5 cms and for Female Height 155 cms. For Hill Area candidates -Height for Male 162.5 cms, Chest 77+5 cms and for Female Height 150 cms. For ST candidates--Height for Male 162.5 cms, Chest 76+5 cms and for Female Height 150 cms. Those who cleared PET, PST and Documentation they are only eligible for written exam. Paper 1 Exam will be conducted for 100 marks and all questions are objective type. Application fee is Rs.100 for General and OBC candidates. Online applications only accepted for this SSB Head Constable jobs through www.ssbrectt.gov.in website. Candidates have to submit application form within 30 days of notification given in employment news. Click here to apply online for the Sashastra Seema Bal Head Constable Ministerial Recruitment 2018. Click here to see the official notification of SSB Head Constable Ministerial Examination. Please share this SSB Head Constable Ministerial Recruitment 2018 article to your lovable friends through social media sites.